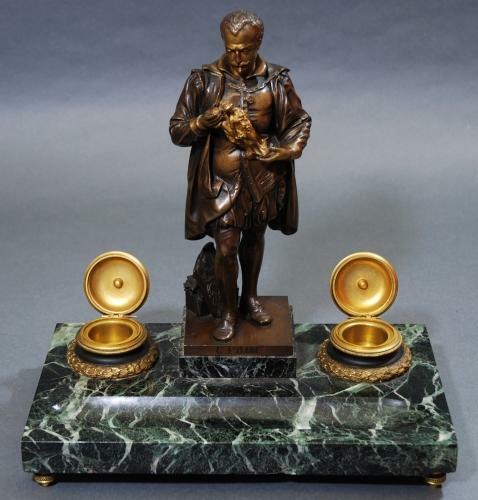 A late 19thc fine quality ormolu & verde antico marble inkstand with a central bronze figure of a Classical sculptor admiring a sculpture. The well defined sculptor is studying a sculpture of 'The Three Graces' that he has handcrafted. His tools are in a box behind him with a fragment of stone. He stands on a central plinth which has the name G.PILON engraved on the front side. Either side of him are finely cast ormolu inkwells with laurel leaf decoration. Infront of the inkwells & figure is a pen tray area. This piece stands on four ormolu feet. This piece is signed 'Injalbert' who was one of the most influential French sculptors. He won many awards & took part in many exhibitions of the period. He was a versatile artist, his work ranging from heads & busts aswell as Classical & biblical groups. This is a very finely cast piece of excellent quality & could either be used as an inkstand or purely as a decorative item.